Especially with regard to competition sailing with this ship, the well-known and experienced solo sea sailor Henk Jukkema had a major input in the creation of the Waarschip 36’LD. The Waarschip 36 “LD has been designed based on a number of specific requirements. The boat must be suitable for long sea sailing competitions with sometimes small to very small (solo) crew. In addition, the ship must be seaworthy and reliable. These conditions create a boat that must be fast, long-lasting, easy to maintain and must retain its value. In addition, the boat with small adjustments must also be suitable for family sailing. 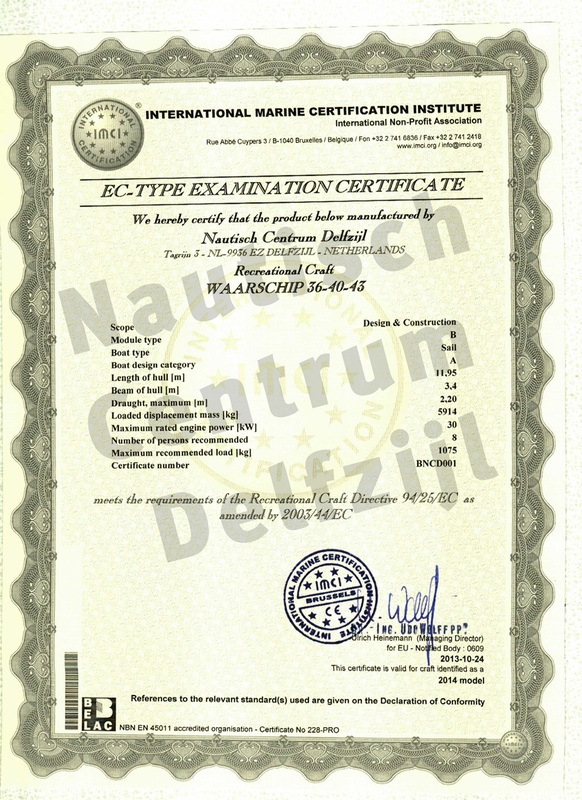 The Waarschip 36 is category CE A tested. Click here for the certificate. Waarschip 36 “LD is a ship with short overhangs, a moderate beam, a slender waterline, fairly strong bending shapes and a low weight. The maximum speed of this boat is above 15 knots. The normal draft is only 1.80 m. This draft gives excellent all-round sailing properties and good stability. For competitions over long distances with a lot of windbreaks, it is better to choose the deep keel (2.20 m). There is also a shallow keel (1.25 m) if your sailing area does not allow a greater draft. However, this is somewhat at the expense of the windy sailing properties. The 36′LD is equipped with ballast tanks. The fixed keels give the ship normal stability. You therefore do not need to use the ballast tanks, but if you use them, you can get more out of your Waarschip, especially upwind. Suppose you are sailing on the wind with a small crew. You do not have a crew to put on windward in the gangway, but you fill the windward tanks (approx. 600 L). That has the same effect as 8 men windward! The tanks are empty for the wind, which makes the boat lighter and runs better. The operation of the tanks is easy. If you do not want to use the tanks as ballast tanks at all, they can serve as storage compartments. You can choose the layout that suits you best. We will be happy to advise you on determining the perfect layout for you.